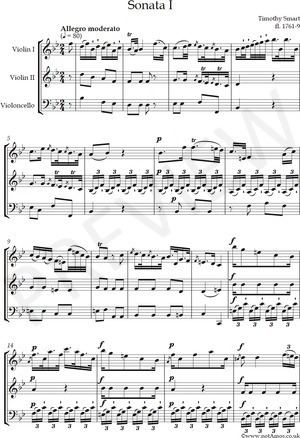 Six Trios for two Violins and a Violoncello composed by Timothy Smart. Price 5s. London. Printed for Henry Thorowgood No. 6 North Piazza Royal Exchange. c.1767. Save for this set of trios, Smart is unknown to posterity. A figured bass, provided in the violoncello part, has been excised from this edition.